Saturday was not a fit day out for man nor beast. That didn’t stop Derek Turner and his longtime friend and fishing partner, Brandon Hembree. The pair fishes the Tennessee Team Trail bass tournaments and came to Dayton from Campbell County, Tenn. to practice for a Feb. 2 tournament. They didn’t think twice about launching their boat at Dayton Boat Dock in a driving rain. Turner and Hembree understand that when tournament day comes they will have to fish in whatever conditions Mother Nature brings so they don’t let foul weather deter them on practice days. Turner says that has been the key to success recently, finding bait schools concentrated in and around shallow ditches just off the main river channel. He and Hembree were north of Hiwassee Island. These days lots of anglers in search of trophy bass are casting Tennessee rigs – massive umbrella-style baits with multiple lures. Not Turner. What Turner was throwing was a 3/4 ounce Rattle Trap, obviously imitating the baitfish swimming in the area. Turner said within five casts in their first spot he caught a 3-pound bass in about six feet of water. Turner was right. He said only two casts later another fish hit. Then suddenly it started screaming drag, the 17-pound test Seaguar fishing line peeling off Turner’s reel and the real fight was on. The fish never jumped so they wondered if Turner might have snagged a big carp. He said it took about three long minutes before he got it close enough to the boat to see it. On his hand scales Turner said the huge bass went well past the 14-pound mark. It was 27 inches long with a 23 inch girth. He knew they needed to take it back to Dayton Boat Dock with more accurate scales, but he couldn’t go right away. 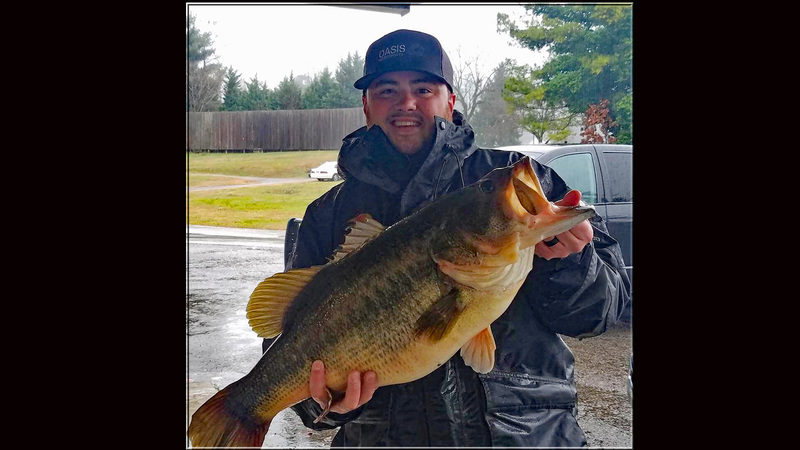 There the fish weighed 14 pounds, 3 ounces – exactly one pound away from the state record caught Feb. 13, 2015 by Gabe Keen, also from Campbell County and a friend of Turner. Up to this point Turner’s biggest bass, actually caught just two weeks ago, weighed 8.4 pounds. Obviously he and his partner are on a great pattern but he’s been around long enough to know that things change. No one keeps official records, other than the existing state record fish. 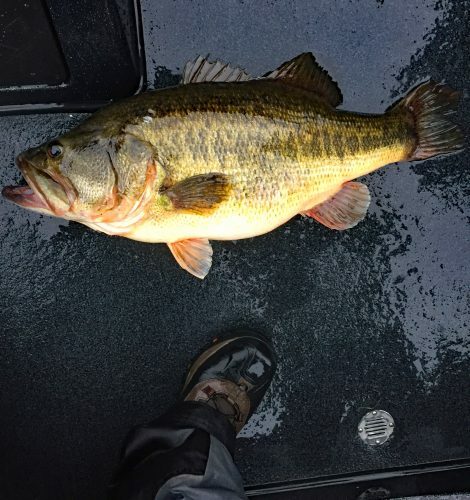 However in this writer’s experience and memory, Turner’s bass may be the third largest bass caught on Chickamauga Lake. Yet another testament to the amazing success of TWRA’s Florida bass stocking program started in the year 2000. With an official weight noted Turner returned the big bass to the livewell. 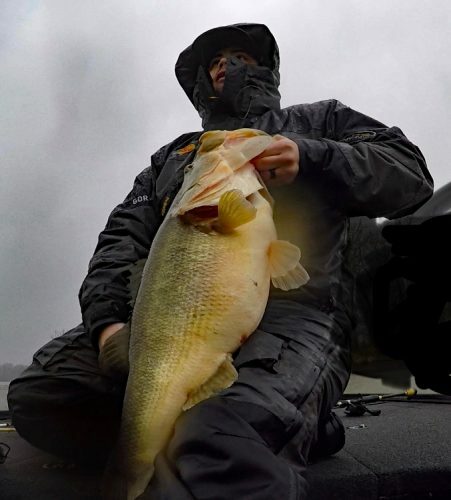 He and Hembree motored back up the river, still in driving rain, and released the big bass in the exact same spot he caught it. That is how you catch, and release, a 14-pound bass. Click here to see the video of the release.